My mother-in-law gave me a Dishing Up Washington cookbook for Christmas. 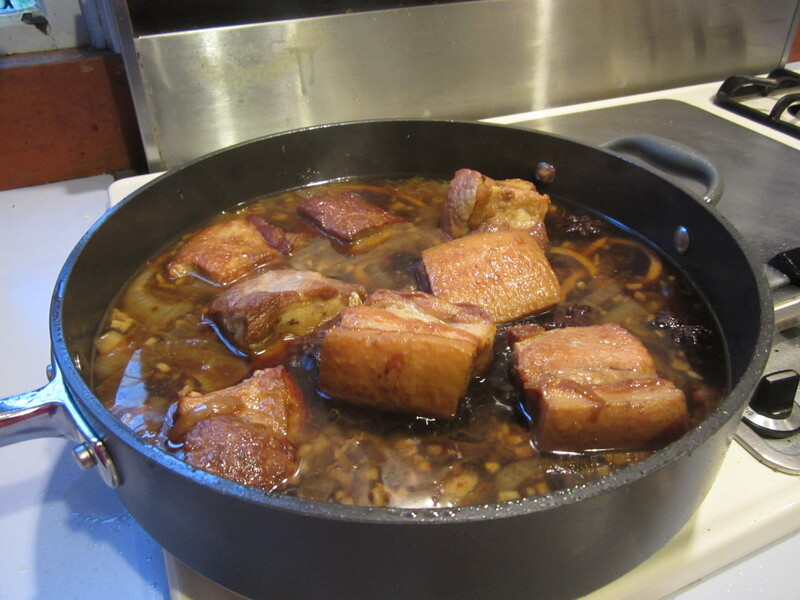 I love pork belly and was delighted to find a recipe that is very different from the usual way I make it. This one has an Asian slant on it and makes the pork so tender, it breaks apart with the slightest touch. In a large skillet, heat oil over medium-high heat. Cut pork belly into 4 squares (or 8 if you have a long pork belly). Place in pan and cook until well browned on all sides, turning occasionally, about 20 minutes total. Transfer to place. Reduce heat to medium-low and add the onion, garlic, ginger, orange peel, star anise, and pepper flakes. Cook until onions are shiny and garlic is toasted, about 8 minutes. Add rice wine to the pan and simmer until no liquid remains at the bottom of the pan. Add soy sauce, broth, and pork belly. Bring to a strong simmer. Cover and cook until pork is fork tender, 3-4 hours. Serve pork over rice and steamed vegetables.